Join the Student-Athlete Advisory Committee (SAAC) as well as the Chatham Student Government (CSG) in an end of the year volunteer event! 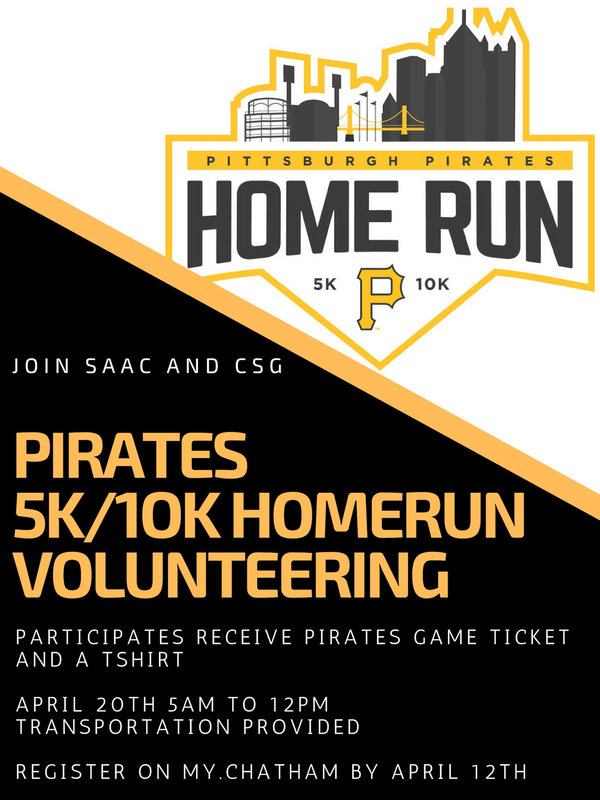 You have the opportunity to join these two organizations in volunteering at the "Pittsburgh Pirates Home Run 5k/10k" event on Saturday, April 20th from 6:00AM-10:00AM. As a thank you for your assistance, volunteers will receive a Pittsburgh Pirates Home Run t-shirt and a ticket voucher to attend a Pirates home game between April 19-25 or May 3-8! We look forward to having you join us in showing the Pirates organization some Chatham spirit!!! Please Register for the event by emailing Alexander Ferrer no later than April 12, 2019. Additional instructions will be provided through email!